Here we are at Ruby Tuesday once again! My RED photos today are some typical ones. 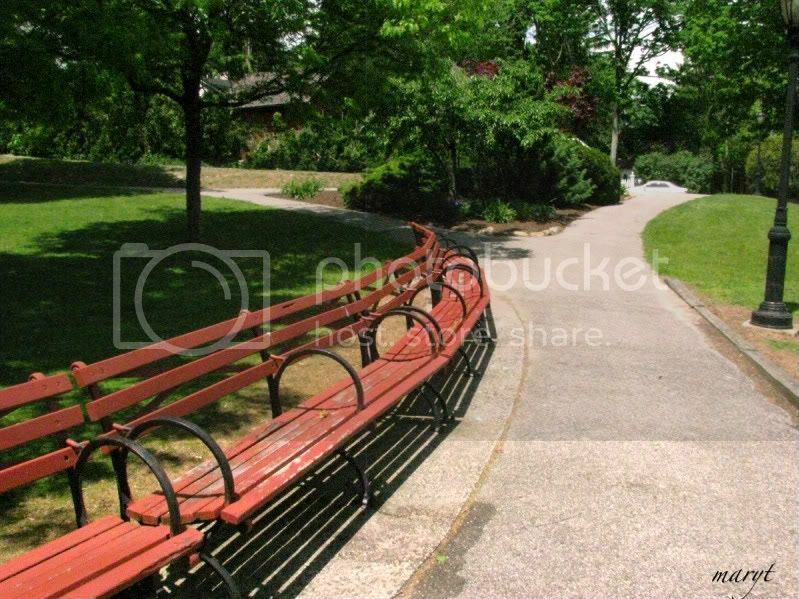 I love the lines and shadows of the first photo - the benches at Gerry Park in Roslyn, NY. When I first saw this RED fire hydrant I laughed when I saw it was labeled "FIRE HYDRANT." I thought "Why did the Town Fathers think it was necessary to label it?" Ever wonder why fire hydrants are painted different colors? The National Fire Protection Association (NFPA) specifies that fire hydrants are to be painted chrome yellow, however it accepts other body colors which were already in use at the time the standard was adopted in the 1970s. Other highly visible colors which have been used include white, bright red, chrome silver and lime-yellow. In jurisdictions where no standard color has been established, the most important aspect is consistency. Standard colors should be adopted which, preferably, are the same throughout the region. Violet has been established as the international color code for non-potable (non-drinkable) water. (Who knew?) Therefore hydrants supplied by non-potable sources should be painted violet (light purple). There is even a standard for heaviness of water flow for hydrant bonnets and caps. that's why sometime you see the top of the hydrant painted a different color than the body. The orange cap above indicates 500-999 GPM. Don't forget to sign Mr. Linky, comment, and visit your fellow participants. I had no idea. Who knew so much thought went into color coordination of hydrants? I certainly didn't. I do know that 500-999gpm is one hell of a lotta water to push through a hose. No wonder it takes six guys to hold onto one of those things. Sheesh! I've never seen a violet hydrant. I vaguely remember the switch from red to yellow as a color for fire engines and hydrants. I'd like to sit on one of the benches. I'm surprised they are empty. We've been watching a series of programs about colour and they've all been fascinating. I had o idea so much science was involved! I love the benches and their worn patina. I just thought cities painted hydrants the way they wanted. The different colored caps now make perfect sense. Thanks Mary! My post is on my photoblog this week: Carletta’s Captures. That is too funny. If you can read, then you probably are intelligent enough to know that is a fire hydrant. LOL!! Love the benches! Those were a great find!! In the hole of Norway my birth town is the only one with fire hydrants, even American made. That's because the factory and the worker's town were built by Americans. They used to be green with red tops. Now they are all red. Other towns simply use the river or a sea as water supply for putting out a fire. We used to be proud of our rare hydrants. Happy idea - paint those benches red - they add color whole year long! How very fascinating. I never knew about the different colour coding. Makes me wonder what they would be in other countries. Thank you for sharing this delightful and interesting Ruby Tuesday contribution. I thought fire hydrants are all painted red. I didn't know they are in different colours. I really like the benches and the shadows. My sister used to live on Long Island. I drove through Roslyn once. I love N.Y. I now live near Ottawa, Ont. and Montreal. Ok I will move on now. WOW! You really did your fire hydrant homework Teach! Good for you! I learned a lot! I'm guessing the hydrants down the street painted to look like Dalmations probably DON'T meet code! The lines of those benches are truly elegant, and their shadows doubly so. Mary, I absolutely LOVE the red benches shot. Love the composition...just like all of it. Thanks for sharing!!! Great shadows from those benches too! Nice bench. I have never seen a fire hydrant that wasn't red. I have a series of photographs of different fire hydrants. By the numbers and names on the tops and sides you can look them up on the internet and get a history of the company and determine the approximate date of manufacture. There are many different looks depending on the company. 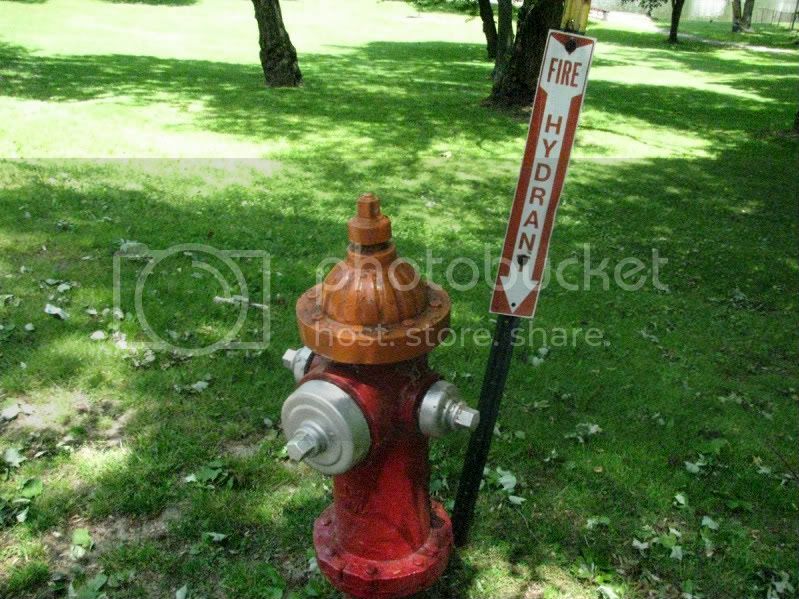 In the collection I have one hydrant that is in the Jack Rabbit storage facility.. When I first rented there it was painted Pink and Blue... but later redone to a blue and red. I also have a picture of one in south Mississippi that is painted as a dalmation dog. It ranks right up there with the dolphin mail box. I think they are fascinating! looks like a perfect day to sit on that bench. I didn't know that either, how interesting!! Love those red benches, they look very inviting. I have been waiting for a meme to have fire hydrants as the theme so that I could use the large collection of hydrants that I have collected from all around the country. I have even studied to learn what the different colors meant. Love your post. But, I'm jealous that you beet me to the posting. It's an bench where I would like to read a bok ! they had yellow fire hydrants in st catharines but they changed them back to red because the yellow ones had to be painted more often and the city was getting sick and tired of putting out the money. i prefer the red ones myself. dad golden was a fireman you know and that is what the air force had, was red fire engines, red fire hydrants and red fire alarm boxes. mary t...how do you find the time to keep up ruby tuesday for us guys and do all of the other things that you are doing, even face book...what a lot of time THAT takes! oh to be young again and to have so much energy! Even I am convinced now that it is a fire hydrant ! For the moment I am in Italy at the Garda lake ! not really vacation, with all the people to visit ! I love the bench too. Perfect place to relax! Great information about fire hydrants! I thought they were all red to match the red fire engines. Love the red benches in the first photo, too. Interesting perspective. This is my first time participating. 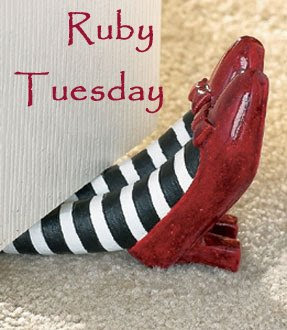 After you coaxing me and hinting when you'd visit and leave a comment, Mary, I finally got a chance to make a Ruby Tuesday Post!!!! Tried and true reds, Mary! So interesting about the hydrants. . . the benches are frameworthy. I love this site! The pictures are beautiful. This is my first submission and comment. I look forward to future postings. I'm late this week but I finally got my Ruby Tuesday post up. Interesting on the colors...I never knew...I always assumed they were red like fire engines are red. Great pictures and Educational!! Thank you so much! Gee you always give us so much interesting info. The hydrants in our town are all yellow. Tuesday comes up quickly, and I am posting late. But I'm here. Thanks for the hydrant lesson. I love learning that kind of stuff. Good thing there are still some red ones around for RT! Re the fire hydrant: Do you live in snow country? If the hydrant is buried under snow, the sign will help firefighters find it. Thanks for all the helpful information about fire hydrant colors. I never knew any of that before! I love those benches ..
Do they really need a sign to tell you that is a hydrant? This was a very entertaining, "gee I didn't know that" post. Thanks. Also, love those park benches. Want some for the back yard. haha I really feel like a newbie today. I just went to last week's Ruby Tuesday and signed up there. This will be my second one. Love the pictures and interesting about the sign. I would've thought so they could fine people when they allowed dogs to pee on it. Ya know something like not a potty but a fire hydrant. I didn't realize there were any standard colors for fire hydrants, either! Mine is a pic of some luscious orange-red rose hips from last September. I really like your benches. They looks so nice, the prefect place to read a book. Didn't know about the fire hydrant colors. Thanks for the info. Mine is posted. Have a great day!! I like that very long, red bench. Looks like a nice spot to sit and enjoy some sun. Speaking of which...where is it??? I'm late to link though my post has been up since yesterday afternoon. I hope you can come by. Mary, your photos always make me want to aim for better, clearer, more artistic work on my part. I always enjoy coming to see what you have offered up. These two captures are no exception. Sorry I'm late. Love the benches, lucky you for such a great red photo op! That is really cool about the colors of hydrants. I was asking the hubs about that recently, and neither one of us knew. It explains why the ones in our town are "light purple" as I always say. They are from re-claimed (non-potable) water. Thanks for the great pics and the interesting info. Keep them coming.